Then I discovered the reason – Waitrose is actively encouraging people to engage in this activity by giving tea and coffee away. Why? 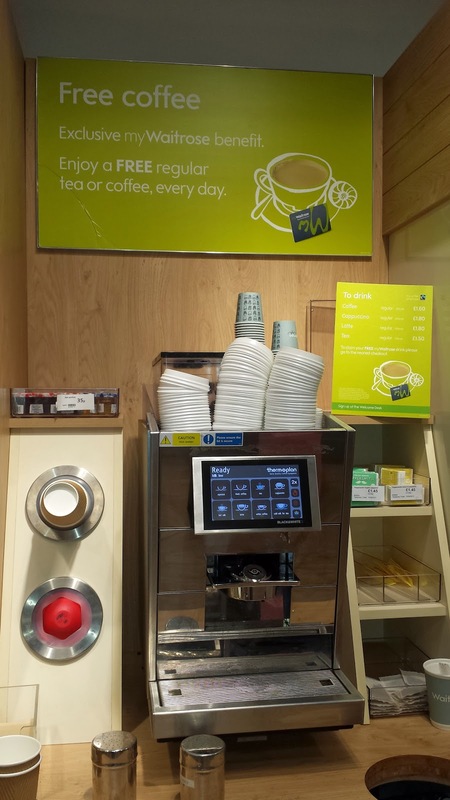 Most likely it is to encourage the impoverished middle classes who can no longer afford their regular fix of Costa or Starbucks (other coffees are available) to join MyWaitrose so they can achieve at least one of their daily caffeine hits free of charge. And of course Waitrose will send them their “penny off” card* and begin to bombard them with direct marketing as well as keeping a record of everything they subsequently buy. But one of the – I suspect unintended – consequences, Waitrose, is that there are people wandering around your stores clutching little paper bombs of scalding brown liquid. Some of these people appear unable to control their shopping trolley with two hands, but now they have a cup in one hand and are trying to steer a metal cart with a mind of its own with the other. I even saw one person with a cup in one hand trying to self-scan items with the other – it’s nearly impossible. It not only inconveniences other shoppers, but it’s an accident waiting to happen. Has Waitrose set aside its legal fund to defend itself in the legal action that will surely follow when a boisterous little Tarquin or Eloise happens to bump into one of these caffeine-slurping shoppers and gets covered in scalding coffee? Come on Waitrose! By all means give away free tea and coffee, but provide some seats and make it clear that trying to do your weekly shop while slurping your favourite hot brown caffeinated drink isn’t acceptable. Or at least fit cup holders to the trolleys! I’d advise that like any other retailer, we take the safety of our customers and our Partners very seriously. I’d also like to assure you that we assessed the safety implications before we made this offer to our customers, from both the health & safety and food safety perspectives. With this in mind we’ve made sure that the temperature of the coffee machine is limited to 62 degrees Celsius which isn’t hot enough to cause burns and is a standard for such machines. We’ve also made sure not to supply cup holders for our trolleys or baskets as this would increase the risk of a spill. This requires the customer to carry their coffee ensuring they take responsibility for it. This offer has been available in our branches for some considerable time and we serve between 500,000 to 1,000,000 drinks a week. I’d assure you that we do record any injuries or accidents that happen in our branches and we’re not aware of any safety incidents involving spilt hot drinks. This lack of incidents supports the assessment of a low likelihood of an accident happening and our decision to provide this offer for our customers. Thanks Waitrose for the explanation, and the blindingly fast response. I still don’t like it, but you’ve assured me that you’ve thought about it and it’s not dangerous. *When the MyWaitrose card was first introduced, the only thing it got you was a penny off each shop – and the possibility of winning the cost of your shopping once a month. So the staff nicknamed it the “penny off” card. It does get you more than that now. This is very interesting. I am currently bed bound with 2nd degree burns caused by dropping a cup of waitrose black coffee down the front of my legs. At the time I needed an ambulance and emergency care. I will be contacting waitrose when I feel able to. Ouch! This was what I was concerned about. My only surprise is that it hadn’t happened earlier. I wish the commenter (who unsurprisingly wishes to remain anonymous – but I know their identity) a speedy and full recovery.